BOONSBORO, MARYLAND—On a recent winter day, Turn the Page bookstore in Boonsboro (population: 3,553) was filled with fans of Nora Roberts, who had descended upon the small town nestled in the foothills of rural western Maryland to get their hands on her latest book and have them signed by Roberts herself. The crowd—overwhelmingly white, mostly middle-aged women in sensible shoes—kept the cash registers ringing. Turn the Page, owned by Roberts’s husband Bruce Wilder, has been a fixture in the town for more than two decades. It’s a shrine to the almost-70-year-old, still-reigning queen of the romance industry (though these days, she prefers to drop the r-word and describe herself as a “fiction writer,” and she’s no longer a member of the Romance Writers of America). “America’s most popular novelist,” as she was called by the New Yorker in 2009, has half a billion of her books in print around the world; 27 copies of her books are sold every minute. During her decades-long career, Roberts’s books—and there are more than 200 at this point, with five new ones every year—have spent a total of 1,121 weeks on the New York Times bestseller list. Want to smell like Roberts? There’s “Nora” perfume oil, 0.5 ounces for $15.99, and “Nora” body lotion, the scent a blend of jasmine and pomegranate. Fans of the In Death books, which features a coffee-loving New York City cop named Eve Dallas and her magnate husband Roarke (no first name), can get a bag of their own Eve Dallas Blend coffee ($13.99), a blue Eve Dallas NYPSD—the “S” stands for “Security”—hoodie ($38.99), a t-shirt that proclaims “I Dream of Roarke” ($26.99), or one that simply proclaims “I <3 Roarke” ($17.99). Shortly after the signing began at noon, I found Karin Adkins clutching an “I <3 Roarke” t-shirt (she already owns the hoodie as well as a nightshirt), its back featuring a quote from one of the books describing him as “the incredibly wealthy, fabulous to look at, sexily mysterious Roarke.” She stood patiently with her aunt Barb Fairhurst as they waited to meet Roberts. There was no rush, despite the fact that they had arrived that morning at 8:30 a.m.; Karin and her mother, who was off wandering the shelves, have come to Boonsboro every year since 2004. Karin, who lives in West Virginia and speaks in a slow drawl, had driven five hours to be there; she estimates that she has a copy of every single book Roberts has ever written. “There’s some books that I have in two or three forms,” she told me, taking out her phone to show me a photo. “That is my Nora Roberts, JD Robb bookcase,” she said, four bookshelves, built by her husband, that line a wall of their home. There’s also Gifts Inn Boonsboro, which sells the custom, locally made toiletries used at the Inn as well as jewelry, pottery, and paintings by local artists. Behind the hotel is Fit in Boonsboro, a gym that Roberts opened when she realized there was no place in town for people to work out. Then there’s Vesta, the pizzeria owned by her son Jason; her other son Dan owns a restaurant, named Dan’s Restaurant and Tap House, right across the street. The latter is a source of gentle amusement to some of Boonsboro’s residents. “She doesn’t have any more sons that need to open a store to make a living, do they?” one woman quipped. All together, Roberts and her family own upwards of $3 million in property in Boonsboro, and she has poured millions into the town and its surrounding counties through her eponymously named foundation since its creation in the early 2000s. There’s scant mention of politics or much of the messiness of the outside world. 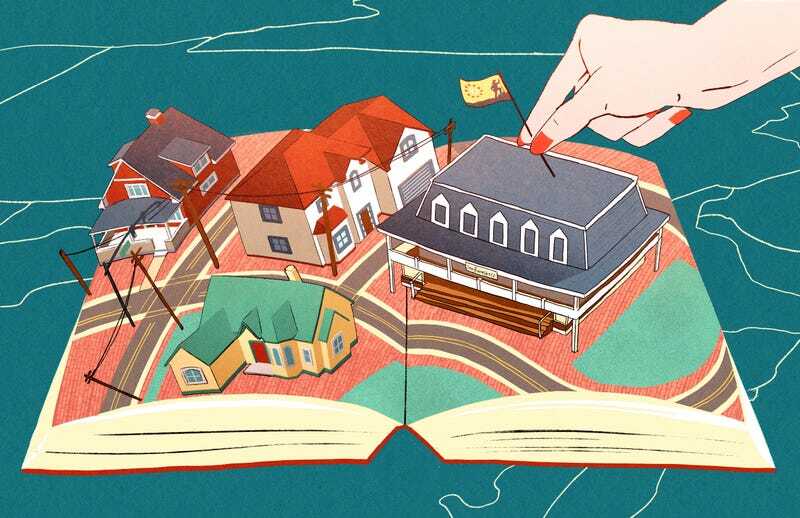 In Roberts’s books, Boonsboro is the kind of place where kids still go to the local pizza shop after work to drop quarters into video games; where antique shops and small cafes can thrive; where young single moms with high school educations can open fancy salons, or a laid-off librarian can run a thriving bookstore. (I should know—I’ve read almost every single one of her books.) In the pages of her novels, life is bathed in a sort of hazy amber glow of town-wide Fourth of July gatherings, family-run ice cream parlors, and grocery stores where the cashiers not only know your name, but have watched you grow up. It’s this nostalgic view of modern life that I suspect Roberts’s readers love. “It just makes me feel like I’m at home,” Karin told me of the feeling she gets reading Roberts’s books. Boonsboro’s downtown has the feel of a place that was created through Roberts’s sheer will alone, and in her image. It’s an appealing vision (and a very white one—Boonsboro today has fewer black residents, percentage-wise, than in 1820, when the census counted 26 enslaved people living in the town), and for fans of Roberts, a visit to Boonsboro can feel like one is stepping into the pages of her books. The town fits the tidy image of the plucky small town that she captures in her trilogy. Just off Main Street, there’s Shafer Memorial Park, a green expanse with not one but three American flags, two old Army cannons, and a sign that warns residents that “horseshoe pitching is permitted in the designated areas only.” Not only can tourists stop by Turn the Page or Vesta or stay at the Inn, they can pop into two gift stores full of tchotchkes handpicked to appeal to a certain kind of middle-aged woman, a new coffee shop (housed in a building that Roberts and her husband own), as well as Pete’s Barber Shop and Crawford’s Confectionery, two local businesses that are mentioned in Roberts’s books about the town. In many ways, Boonsboro’s downtown has the feel of a place that was created through Roberts’s sheer will alone, and in her image. It’s clear she doesn’t do this for the money—she still lives in the same home she moved into as a newlywed with her first husband in nearby Keedysville, and Forbes estimates that she is worth almost $390 million. Whether a town the size of Boonsboro needs two gift shops—there are only so many organic cotton throws one can own—versus a hardware store is another question. But Roberts has a clear vision for the town. “Boonsboro wouldn’t be able to support a bookstore if not for Nora,” the store’s manager Janeen Solberg told me. “I think of it as being Nora-ized,” Michelle Kimble, Inn Boonsboro’s resident innkeeper, said. “We wanted to give back as much as we could,” Roberts told me, her smoker’s voice low and raspy, when I asked her about her work to revitalize Boonsboro. Dressed in a black leather jacket and knee-high black boots and clutching a can of Diet Pepsi, she was getting ready for a long day of book signings, which would take place in a room off to the side of the bookstore’s main space. In the corner, her daughter-in-law Kathryn was working the cash register; her son Jason was nearby meeting with a group from the Sage Hawk Foundation, whom Roberts’s foundation funds; they had come to express their appreciation and shake the hand of their benefactor. “It’s this gorgeous old building, and I just fell for it,” she said, before coughing. I walked around town while she signed book after book. Main Street was packed with groups of women clutching teal blue shopping bags from Josie’s, which was doing a brisk business (I bought an apron myself). The Inn’s gift shop was packed, the restaurants and coffee shop buzzing. The sun was shining; there were no empty parking spots. Smiles abounded. Welcome, as the town’s former mayor Skip Kauffman used to call it, to Noraville. “It all goes back to Nora and Bruce,” Kauffman, who served as Boonsboro’s mayor for 28 years until he retired in 2012, said of the town’s revitalization efforts. Before Nora arrived, Boonsboro was a shell of its former self. “When I was growing up, there were a lot of businesses on Main Street. There was a shoe store, a clothing store, a hardware store. And then, everything kind of started to close up,” Cindy recalled. Her dad used to own a diner on Main Street, in a building that’s now occupied by a Subway sandwich shop. “She kind of adopted this as her town,” Cindy said. “There’s very few major projects around town that she hasn’t been a part of,” Skip added. Nora finds the idea of Noraville “hysterical.” “Because it takes more than one person,” she said. “Everybody has to work together, and it’s a tapestry. You have to weave your people together.” In an interview with the New Yorker from 2009, Nora brought up the Irish idea of comhar, which as she describes it, ”means a sense of community and neighbor helping neighbor.” “This is my home. I’m fond of home,” she told the Washington Post in 2012. Nora, who spends weeks hunkered down in her writing cave, is rarely seen in town apart from her book signings (one resident told me a friend once told her that he had seen Nora zipping by in a car with a vanity plate spelling AUTHOR), but she has not only remade Boonsboro’s Main Street, she has also donated millions to local causes. In 2000, Roberts set up her foundation which is now run by her youngest son Jason and his wife. According to IRS documents, from its founding to the end of the 2015 fiscal year (the last year for which data is available), it’s given out roughly $17 million in grants, much of it spent locally. Here’s just a snapshot of what her largesse has wrought over the years: her foundation has donated to hospitals in the region, the Boonsboro Elementary School for music equipment, hiking programs for kids, nature programs, storytelling programs, a local high school academic competition, museums, food assistance programs, the new fire station in nearby Sharpsburg, the local library in Hagerstown, a museum dedicated to the National Road (the first federally funded highway in the nation), a teen pregnancy prevention program, the Boonsboro Trolley Museum, local film festivals, and countless other projects, from a women’s shelter in nearby Hagerstown to local ambulance and firefighting services to hundreds of thousands to regional colleges. Boonsboro’s recycling program was kickstarted by a grant from the foundation, as well as the town’s plans to build a pool in Shafer Park. In 2017, her foundation entered a public-private partnership with the county to build a $2.5 million auditorium at Boonsboro High, with the Nora Roberts Foundation fronting half of the cost. Before Nora, Boonsboro was best known for its cantaloupes and for being the home to the first monument dedicated to George Washington. Tourism, and Nora, are filling a void created by some of the same seismic economic shifts that have wracked towns and cities from the Rust Belt to this small corner of Maryland. In Boonsboro, people still bring up the 1994 closure of the London Fog factories in the region as a shock to the local community, one that signaled in the words of a news report at the time “a way of life” that was ending. That year, the company shut down its sewing facility in Boonsboro and two nearby clothing plants. The company moved all of its factories overseas; all told, 1,300 people lost their jobs, just one shock of many in a region of the state that turned from a manufacturing hub to a service-based economy in less than one generation. The local newspaper’s obituaries are filled with people who used to work for the clothing company. As the then-mayor of nearby Hancock put it, the closure “is really gonna hurt us. A lot of [factory workers] bank here, a lot of people buy groceries here. It’s going to drastically impact our merchants.” Today, there’s no shortage of jobs (unemployment in the county is low, hovering around four percent), but Boonsboro residents without college degree, are more likely to get a job as a customer service representative at Citi’s nearby call center, where the pay is around $11.47 an hour, than at a factory with a tidy pension waiting at the end. Elaine and Jim used to work for the federal government; Bill was once a dairy farmer. All three praised Nora’s impact on Boonsboro. “There’s a lot more tourism now than there used to be,” said Bill. More change has come to Boonsboro in recent years—more tract homes thrown up by real estate developers on former farms outside the town’s core and more people moving in who, like the owner of one of the town’s two gift shops, wanted “to get out of the rat race” and are drawn by the idea of, as another recent transplant to Boonsboro put it, “stepping back into time.” Boonsboro’s residents have a median household income hovering just over $66,000, but many with good-paying jobs find themselves commuting to Baltimore or Washington, DC. Boonsboro has turned into a bedroom community. It’s a pretty picture, but one that doesn’t quite match up with recent events in Boonsboro. This tidy, picturesque town has—ever since Donald Trump announced his candidacy—been roiled by political strife and infighting. “The Trump mindset now is crazy,” one former member of the town government, who wished to remain anonymous, told me. Washington County has been solidly Republican for decades and voted overwhelmingly for Trump in 2016. But for years, Boonsboro’s local government has been staunchly nonpartisan. That began to change in the spring of 2016, with the election of new council members, including Marilee Kerns, the secretary of the Washington County Republican Central Committee to the town council, who upon their ascendance began to sharply criticize everything from the town’s spending and staff salaries, push for budget cuts, and vocally complained about planned water and sewer rate hikes. The latter was so contentious that one resident, Robert Sweeney, started a petition to put a citizen’s referendum on the rate hikes on the ballot, which was signed by a third of the people living in Boonsboro. Sweeney later filed a complaint with the state that the mayor and some of the council members had violated Maryland law. Council meetings got so acrimonious that at one point, a Boonsboro resident got up and read the Serenity Prayer, and Skip Kauffman, the former mayor, pleaded for people to put politics aside. In February of last year, the long-serving town manager resigned, saying her decision was due to “a continued lack of respect for individuals who know the government in Boonsboro.” A few months later, the replacement town manager, Megan Clark, stepped down, as did the chair of the Boonsboro Municipal Utilities Commission. “With the election of two new members, distrust, accusatory statements, and lack of communication has flourished,” Clark said. Last May, Boonsboro likely had its first elections where a political action committee—Boonsboro Citizens for Responsible Government—played a role. The group put up a billboard in town that read “Take Back Your Boonsboro Government” and campaigned for its slate of candidates; all four won, signaling a conservative takeover of the small town’s government. Cindy Kauffman and Janeen Solberg, likely exhausted by the battles of the previous two years, had decided not to run for reelection. Kauffman had been the target of attacks on the Boonsboro Citizens for Responsible Government’s Facebook page. “Do you think Cindy Kauffman is looking after the best interest of Boonsboro taxpayers ?” one post read. Some have raised concerns, too, about Nora’s outsized impact on Boonsboro. Update (March 21, 2019): The story has been updated to reflect that Brigitte Schmidt did not run for re-election at the end of her term. An earlier version of the story said that she stepped down from her position on the town council. Jezebel regrets the error.